Nest redefined the thermostat, transforming it from the home’s most-ignored appliance into a conversation piece. Can the company duplicate that magic with the much-cheaper Nest Thermosat E? Unboxing the Nest Thermostat E, it’s clear this is thermostat is different from the rest of the Nest line. It’s smaller, made of white plastic, and looks a lot like a hockey puck. All that plastic provides the distinct sense that yes, this is definitely the budget version. 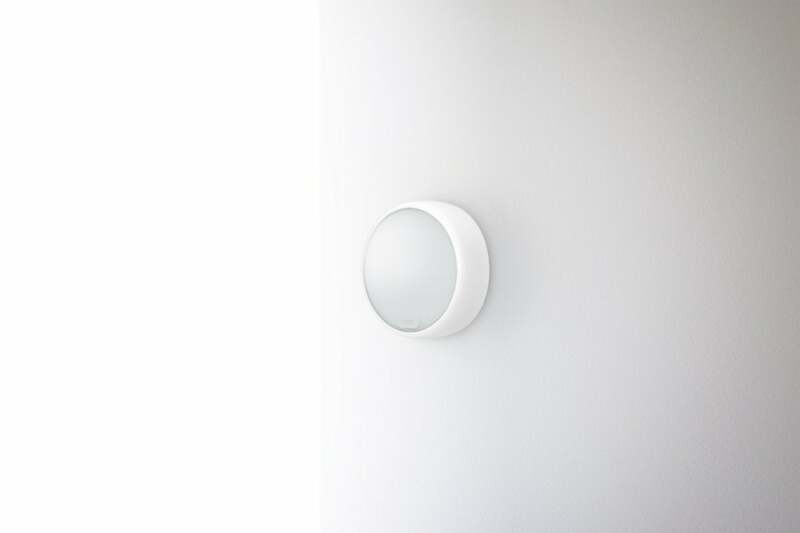 Based on the assumption that wherever most thermostats might be, off-white is the color that best blends in overall, the Nest E is definitely meant to just sink into the backdrop. On an actual white wall, it does a good job of being discreet. The frosted white screen stays blank until the motion sensor detects your presence, then it lights up with the temperature setting in large numbers. As with their other units, the Nest E is controlled directly with its outer dial. The side housing spins to easily adjust the temperature up and down or highlight menu options, and the actual display is also a button for selecting options. When the Nest Thermostat E sleeps, it will virtually disappears into a light-colored wall. The Nest E uses its smarts to learn your preferences through the manual changes you make. It will also monitor your comings and goings to build a schedule so that your home is warmed and cooled only when you’re there to enjoy it. Or if you prefer, you can choose a pre-set schedule to start saving money immediately. On that level alone, the Nest is ideal for people who never want to fuss with their thermostat. For those who want more functionality, the Nest does allow for actual manual scheduling. The thermostat will even display a green leaf signifying energy saving temperatures when you adjust it. The Nest app provides a detailed history of your HVAC usage. Nest’s app tracks all usage, so you can easily monitor changes, which is great for users who like more control and information. The app also supports geofencing, if you want automation features. For new users, the Nest E’s interface can be a little strange though. It shows in large numbers the temperature you’ve set it to, but in smaller numbers, you’ll find the actual temperature of the room (and how long until it reaches its assigned temperature). This can be confusing at first. And unlike the more expensive Nests, the E lacks both a clock and a weather function. The biggest difference between the higher-end Nest and the Nest E, however, lies in its HVAC system compatibility. Where the more expensive model is compatible with 95 percent of all HVAC systems, Nest issues a more nebulous “works with most systems” statement for the Nest E. This basically means that if you have anything beyond the conventional one- or two-stage heating and cooling setup, the Nest E probably won’t work for you. Heat pumps and fans should work, but components such as humidifiers or dehumidifiers won’t. The thermostat doesn’t require a C wire, though, and my installation was straightforward and simple. The $80 price difference between the Nest E and the third-generation Nest Learning Thermostat is easy to see—and feel. 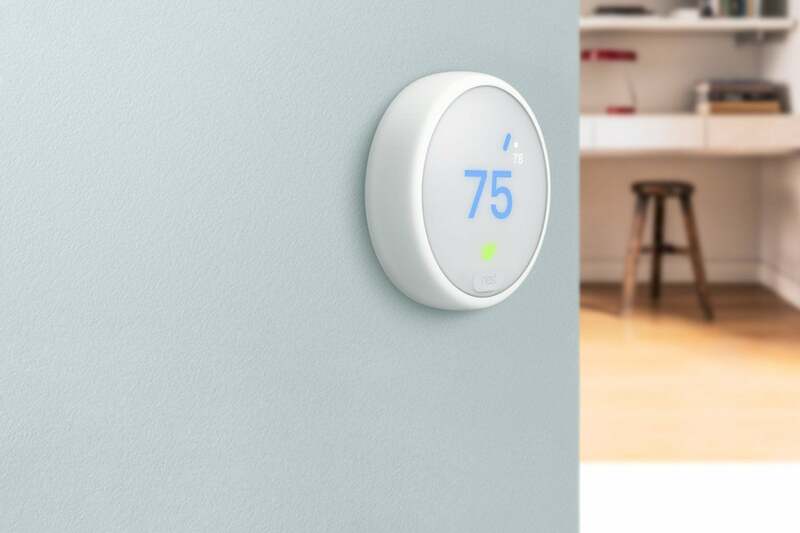 But no one will mistake the Nest E for a generic thermostat, and you’ll still benefit from nearly all the features that have made the more expensive so popular.